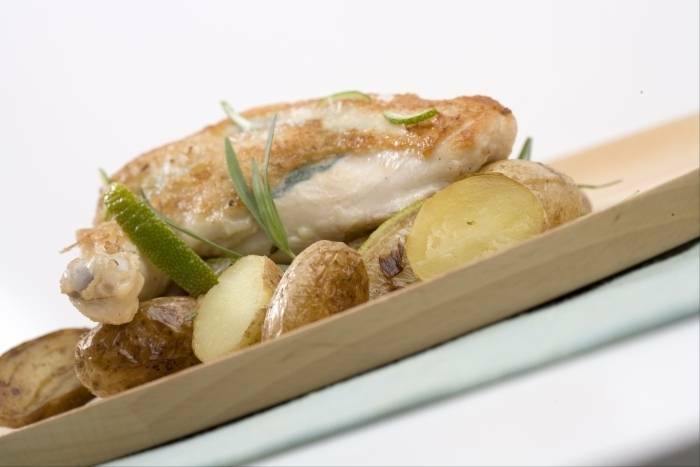 Tender chicken breast cooked with lime leaves and served with pan-fried potatoes. Gently lift the skin away from the chicken flesh and place a lime leaf underneath. Bring a pan of salted water to the boil. Add some lime leaves and the lime quarters and blanch the potatoes for 10 minutes. Drain the potatoes, remove the lime quarters and leaves. Gently fry the potatoes in olive oil until golden brown. Heat up a second frying pan, add a little olive oil and brown the chicken on both sides. Transfer to a baking tray and finish cooking in the oven for 5 minutes. Serve the chicken with the potatoes and garnish with a couple more lime leaves.